The societal direction, clues, hints and the “don’ts” cannot accurately define, or direct your journey of Love. The journey of Love is not something you stress over, or become anxious about. Your life combined with the journey of Love integrates and creates dynamics of synchronistic situations that are either temporary, in the interim, or permanent. We miss the enjoyment of every casual encounter, and interesting get-togethers, and the fantastic interim meeting of people, all because we are focused on the long term of Love. Speculating and hesitating whether to enjoy someone who comes at an in between time in our lives to engage in some temporary Love play, is due to societal relational standards, by which we try to live by; yet our statistical numbers of Love, like marriage, is ranking over a staggering 50% in divorce. So much for standards working in our favor! Our individuality, and the various dynamics that makes us different in the ways of creativity, actually proves there is no one size fits all for happiness, except what works for you. For example, worrying about someone being too young, regardless of the maturity of their mental capacity, remains a primary concern for women, but not so much for men. Some men have no reservations being with women half their age. What a contradiction of standard by which many women allow themselves to be governed by. We cannot gauge our lives against a contradiction. Fearing what others think or say does not fulfill our longing to be with someone. What good does it serve to meet the expectations of your circle, family, and society, if your heart wants Love? I’ve been there. Doing all the right things. Being the right person. Living the life of example. Governing my life by the expectations of others. Now, I have learned the balance, after breaking off from the continual pressures of expectations. Trust me when I did everything perfectly right— I could not govern the other person in my life and he was not governing himself by the same standards. I lost my fight to being right by someone else’s right to live their life (wrong or right) and forgot who I was, because I was living in the views of what others thought was the light for me, without them having any insight into my plight. We are controlled by too many things. Don’t be deceived. Those who are controlling and try to control the lives of others, are not entirely happy on the journey that has been dictated for them. Those who dictate only do so, because they have lived the life of being dictated to. Don’t live that life. Live the life that works for you. Love comes and presents itself in many ways. The prohibiting “descriptive” choices like someone is too short (okay no midgets— I think) too dark, not attractive enough, not enough money, or not from the same country are all the don’ts we live by. Where did those don’ts come from? Experience? Not likely. I’ve seen good men and women with not much money do whatever they needed to do, and get whatever they needed to get, because they were hard working. I’ve seen mixed cultures, make their relationship dynamic by being open enough to allow the crossing of cultures to integrate and shape their relationship with many angles of variety. Living by a standard you have not even tried or explored is like passing a gold mine every day, saying it is wrong to go in and not check out a golden nugget, or ever having touching one. Now this paradigm of gold may sound ridiculous, but only because we have seen, (not experienced) the results of someone coming into wealth because of gold. We live not by our own experiences, but what others have dished down to us about our own golden nugget of happiness. Time is another pressing concern we live with, and all the while it is passing us by. Stop waiting to live while waiting for the permanence of Love. Live for the now. Now is all we have. Time is a force no one can control. It has a way of moving swiftly when we use it foolishly. It has a way of stalling when we want it to move faster. It will lovingly linger when we capture every moment. How can we dictate what time is what, yet have no control over what it does? The only peace we have when it comes to the timing in our lives is to live sensibly, peacefully, objectively, lovingly, authentically and yes, you ready? Enjoy it! Make every moment count! Love has worked in my life from all angles— the long term, to the interim, to the temporary and I am not even sure that who I Love now will be forever, but I don’t care, because I love the journey! I am in awe of a chance meeting where the convergence of a connection, even if for a short time is made. I relish the times, because I didn’t dismiss the how of the connection, and I didn’t focus on the why of the connection. That is the magic. Love does not always come to stay. Sometimes it just stops by! Perhaps our long term relational failures, by the societal standard, is because we are not seeing that Love, sometimes, come in to our lives only for a time, but we force a stay. When that stay is meant for short term we create a disruption of time, and the stay becomes corroded, painful and ugly, because that Love has gone beyond its course. When you live authentically, and you are on the right path, the universe will validate check points in your life by creating the synchronistic wonderful convergences that will prove you are on the right path. Believe in Love, and it will unfold in many ways. Believe in your journey! This entry was posted in Live and tagged fear of never finding love, following the crowd, journey, living by the standards of others, loneliness, the journey of love. Bookmark the permalink. 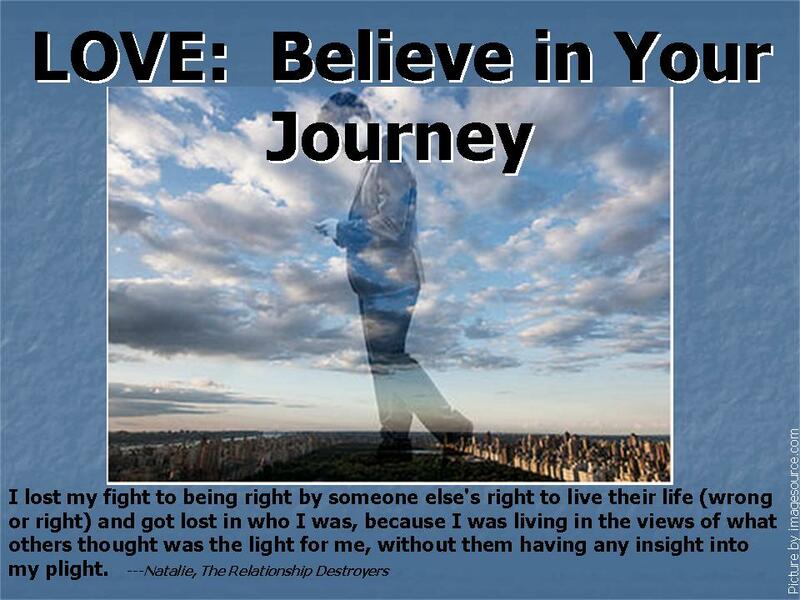 1 Response to LOVE: Believe in YOUR Journey! Natalie, what another prodigious, explosive piece! As always, you manage without fail, to capture every facets of the true matters of the heart! This piece has spoken to me in many ways! Many of my yet unvoiced questions have been unremittingly answered! You are equitable as always in your writing! You have the ability to capture and maintain the heart of your readers! Here’s to making it count, to your illustrious piece!